New on NA cafe’s menu: Ketchup à la cockroach! Ketchup in National Assembly cafeteria sprang up a surprise dead cockroach in its red-layered folds, sending shivers down the spine of PPP’s Shazia Marri. The event occurred when a renowned doctor ordered sandwiches accompanied by a ketchup bottle of Maroof Company, out of which a dead cockroach was discovered, which the disgusted parliamentarians promptly brought to the notice of Opposition leader Khurshid Shah, who asked selective parliamentarians to investigate the issue from cafeteria management. Bottles stocked, but not yet opened were also checked, while the company and the contractor were held responsible for the issue, with the contaminated bottle confiscated and sent to senior officials of National Assembly and Senate. A letter was also forwarded to the NA speaker level authorities requesting strict monitoring of the cafeteria, and urging the food contractor to maintain hygienic standards. 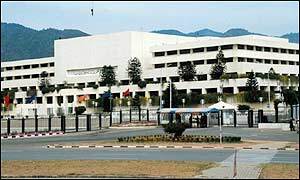 The contract for assembly cafeteria had been given to Tandoori Restaurant, after which it was diverted to a company, while parliamentarians had always been raising the issue of food standards in assembly cafeteria. The appointments imply that front runner and the senior most military officer Lt. Gen. Haroon Aslam, currently serving as Chief of Logistic Staff, was not considered for the position.